Most concerts presented by the Boston Modern Orchestra Project have a theme of some kind. These range greatly from concert to concert and over the years; this is one of the reasons why BMOP concerts have been so varied and maintain their interest over the long term. The themes may refer to a period, a nationality, an individual group of composers, a style, a source of inspiration, or some other idea. For the first concert of its 20th season, BMOP chose its theme for historical reasons. This year represents the centennial of what has been regarded as the first Holocaust of the 20th century, the deaths of some 2/3 of the population of Armenia and the dispersal of many others throughout the world. This Armenian Diaspora had a particular effect in the Boston area, where so many of those who survived chose to settle. Sunday’s concert commemorated that tragic event with a program devoted to music by Armenian composers and featuring Armenian soloists. (Not surprisingly, there was also a large Armenian presence in the audience.) The program as announced had one non-Armenian work, the Piano Concerto No.1 by Shostakovich. 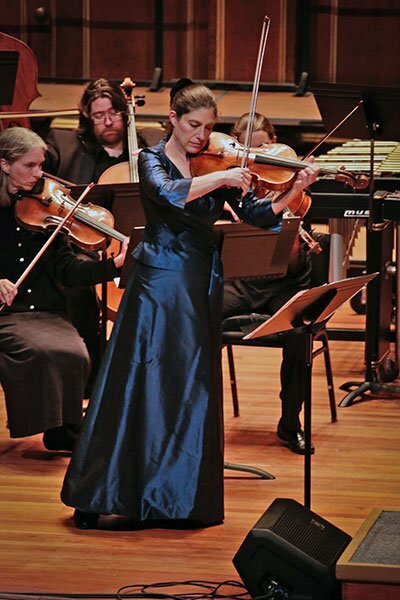 Illness prevented soloist Nareh Arghamanyan from appearing, but happily one of the world’s leading violists was immediately at hand in the person of Boston’s own Kim Kashkashian. With the exception of a handful of soloists, the instrumental forces for the concert consisted entirely of a string orchestra. The first work, Cloudy Sky, paid homage to Komitas Vardapet, regarded as the first significant Armenian composer of the modern era. It is an arrangement of a folksong, which set the tone for the melodic style of the afternoon, since a great deal of Armenian music is derived from liturgical chant or modal folksong. This short piece, arranged for strings by Sergei Aslamazyan, was both lyrical and somber, an appropriate opening for the concert. The second piece featured music by the best-known American composer of Armenian heritage, Alan Hovhaness. Born in Somerville, Massachusetts, he studied at the New England Conservatory with Converse in the 1930s, but when he attended Tanglewood as a composition Fellow in 1943, his work was harshly criticized by both Bernstein and Copland. He rethought his entire compositional process, particularly in the light of his heritage, with emphasis on Komitas. Many of his works following this reorientation made use of modal scales and musical ideas derived from Armenian culture. For Sunday’s concert Gil Rose chose one of the first of the pieces in this new style: Khrimian Hairig, a 1944 composition for string orchestra with solo trumpet. It is a work of modest length, in tribute to a significant spiritual leader in 19th-century Armenian history, cast in three sections, called arcs, played one after the other without pause. The trumpet soloist, Terry Everson, had a pure, lyrical tone that contrasted elegantly with darker and more subdued string parts. Replacing the Shostakovich Piano Concerto was a work by the Israeli composer Betty Olivero, entitled Neharót, Neharót, for the colorful combination of solo viola, accordion, percussion, string orchestra divided into two ensembles, and magnetic tape. The elements of the score, derived from Middle Eastern musical styles, were especially suited to match the commemorative music of the rest of the program. It expresses lamentation; the Hebrew title means “Rivers, Rivers,” referring, as the composer notes, “floods of tears that are often shed by mourning women in disaster situations.” For the first half of the piece only instruments are heard: the accordion (played by Cory Pesaturo), the viola, and the string orchestras. Gradually the soloists develop highly ornamented melodic lines over string lines that remain lyrical and fairly simple, except for an occasional solo outburst. But halfway through the piece the prerecorded tape begins, with vocal music of lamentation from a number of cultures in the Middle East, Africa, and Spain, as well as passages from Monteverdi. The work was written for Kim Kashkashian, who gave the world premiere in 2007, and was happily available to repeat it in this performance. Its particular intensity of conception and performance made it a highlight of the concert. The second half of the program was devoted entirely to one piece, a choral work with string orchestra and two vocal soloists by Tigran Mansurian, generally regarded as the most significant living Armenian composer. His 2011 Requiem, receiving its Boston premiere, certainly evoked a mood appropriate for this concert. It sets eight sections of the traditional Latin Requiem, some of which feature the male or female sections of the chorus, others employ the full ensemble. For the most part the mood is sober and dark, though the Kyrie summons the Lord in shifting, dancing meters, alternating with a far quieter, chantlike Christe. There are sections with vocal solos, two each for a soprano and a baritone. As befits the theme and purpose of the concert, both of the fine soloists represented their Armenian heritage. The soprano, Serena Alexandra Tchorbajian, is a freshman at Harvard, who has studied at the Juilliard Preparatory School. The baritone, Vartan Gabrielian, is completing his bachelor’s degree at the Curtis Institute of music. Both young singers offered clear, beautiful expression to their solo passages. 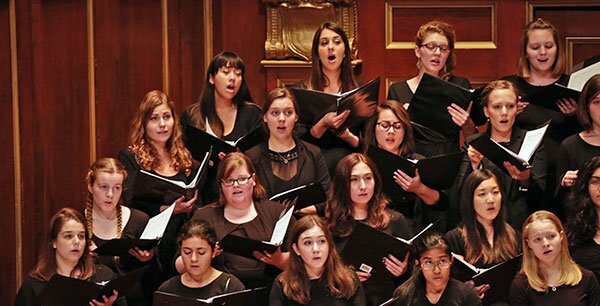 The choruses were derived from two local universities: the Harvard-Radcliffe Collegium Musicum, directed by Andrew Clark, and the Boston University Marsh Chapel Choir, directed by Scott Allen Jarrett. Their ensemble was clear, with a beautiful choral sound. The work as a whole struck me as having too much text repetition and too many sustained pedal points to retain attention throughout, but it is without question a suitable work for mourning, and made an appropriate conclusion to this particular BMOP concert. Is there a way yo watch the concert online? I know it has been a great concert.